A five-part miniseries will take viewers behind the scenes of some of Broadway’s most beloved musicals that are currently touring the country- including School of Rock and Cats! The Balancing Act, an award-winning morning show on Lifetime, and Broadway Across America are working together to produce the fifth season of the popular TV series, Broadway Balances America. Broadway Balances America provides access to interviews with casts, crews and creative teams for an in-depth look at what goes into creating the magic of each production on the road. Two of the production on the line up are headed to our stage this Broadway season School of Rock and Cats. On the second episode of Broadway Balances America, viewers will gets an all-access look at life as a pint-sized musical prodigy in School of Rock. Meet talented rockers Ava Briglia, Layla Capers and Montgomery Lamb as they welcome host Amber Milt into the band and share what it’s like to balance being in a Broadway show with being a kid. During the fourth episode, Broadway Balances America will celebrate one of Broadway’s longest-running shows as it tours across the country with Andrew Lloyd Webber’s new production of Cats. 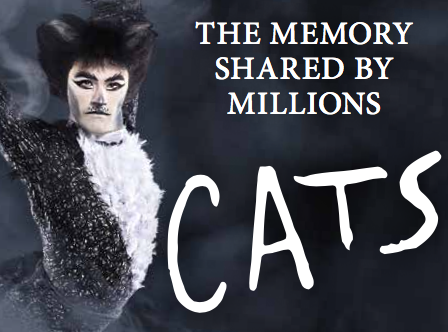 Milt revisits the record-breaking musical spectacular and transforms into a Jellicle cat with the help of the production team. Other performances that will be featured in the series are Anastasia, Come From Away and Miss Siagon. Anastasia is a romantic new musical that will transport audiences from the twilight of the Russian Empire to the euphoria of Paris in the 1920s with the Sept. 24 premier of Broadway Balances America. Then, award-winning musical Come From Away revisits the remarkable true story of September 11, 2001, and the days that followed in Gander, Newfoundland on Oct. 22. Finishing the fifth season of Broadway Balances America, Miss Saigon gives viewers a glimpse at the legendary musical that changed Broadway forever and continues to resonate with audiences today. Find tickets and information on the two shows coming to Walton Arts Center by clicking their images below!